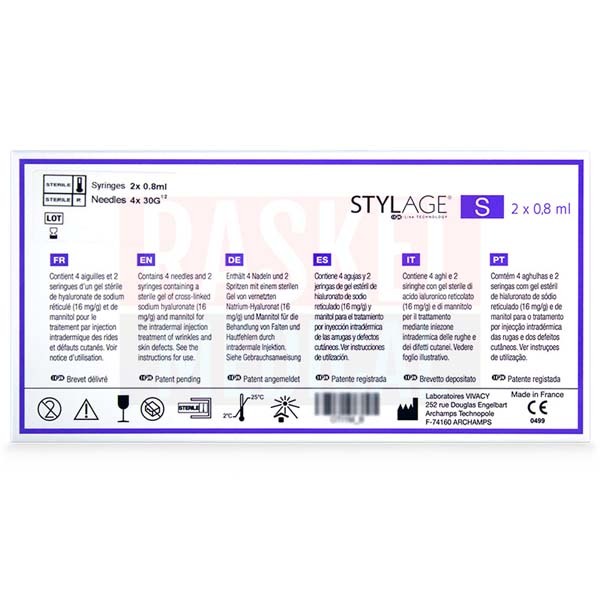 Stylage S is an aesthetic dermal filler that is formulated to fill in superficial wrinkles and fine lines. Unlike other injectable brands, this treatment contains mannitol, which is used to extend the longevity of its main ingredient, hyaluronic acid. In doing so, the cross-linked hyaluronic gel maintains its durability and resists breaking down for long-lasting results. By using this ultra-hydrating injectable for the face, your patients can combat premature ageing. This member of Vivacy’s extensive line of facial fillers is intended to smooth out fine lines and wrinkles, such as periorbital wrinkles and glabellar lines. Made from hyaluronic acid and mannitol, your patients will instantly notice its plumping powers: upon injection, it transforms dry and textured skin by adding moisture and volume into the dermis. The incorporation of Mannitol in this formulation prolongs the hyaluronic acid’s lifespan within the skin, giving it the ability to fend off potentially damaging free radicals. Meanwhile, hyaluronic acid binds with up to 1000 times its weight in water molecules within the skin, adding natural volume and hydration to the skin for a more youthful-looking appearance. 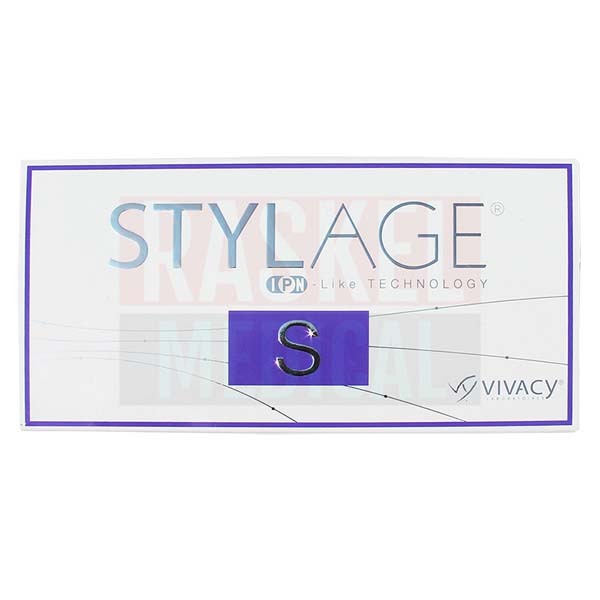 Stylage’s entire line of products is manufactured by Laboratories Vivacy. This product is sourced from Europe. When can Stylage S cause side effects? As with any injection, there is potential for side effects to occur with Stylage S. However, mannitol reduces the risk of inflammatory side effects, as it carries antioxidant properties. Otherwise, typical injection-related symptoms may occur, including tenderness, pain, itching, and discolouration where the needle penetrated the skin. Generally, these symptoms are temporary and should clear up within a week. For a full list of other side effects, precautions, and contraindications, refer to the product leaflet before administrating the injection. Which skin type is Stylage S good for? This treatment is ideal for skin with subtle signs of superficial wrinkling. Dehydrated and slightly saggy skin will also see benefits of undergoing this dermal treatment, as this formula adds moisture to the skin as well as volume. What is Stylage S made without? While some dermal fillers consist of animal-sourced hyaluronic acid, Stylage S is characterized as a vegan injectable, and is made without animal byproducts. Each package is sterilized and should only be handled by licensed medical professionals who are trained to administer dermal injections. The syringe and needles provided are single-use only. Only use the needles in this package for this treatment. This injectable has been tested for its efficacy, safety, and performance by skin experts. What is the difference between Stylage S, Stylage XL, and Stylage XXL? 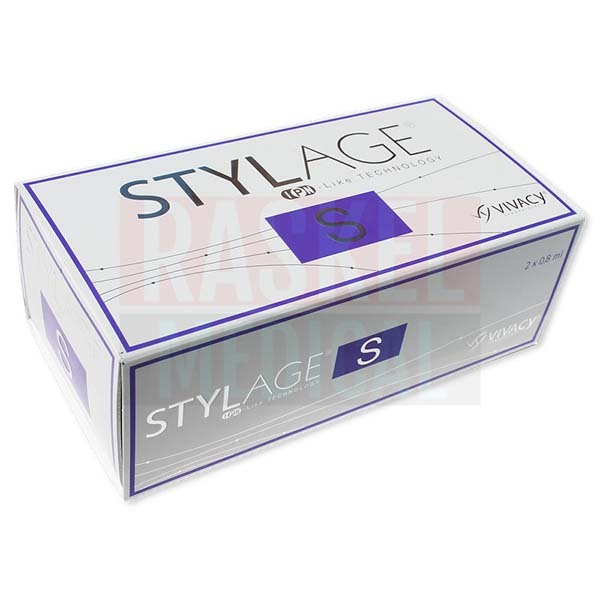 Stylage S helps to correct faint lines and wrinkles, while Stylage XL works primarily as a volume-booster. Stylage XXL is an extreme volume enhancer, with over a year’s worth of results from a single treatment. Together, this line of cosmetic injectables works to give the skin a healthy-looking appearance, 1 treatment at a time. Determine where Stylage S will be best suited to work effectively. From there, create an individualized treatment plan. This will determine how many units to inject, and how often they should be injected to achieve the desired result. Prep the skin and disinfect the injection site using a 60-70 percent alcohol-based solution on a single-use swab or cotton ball. As the disinfectant dries, attach the pre-filled syringe to the sterile needle, and do not let it touch any contaminated surface. Locate air bubbles by tapping the tube in an upright position, needle pointing towards the ceiling, and remove them. For correcting wrinkles, insert the needle into the superficial to middle dermal layer. After you have removed the needle, softly massage the area to ensure proper distribution of this filler. Dispose of the needles and any remaining fillers safely. Each pre-filled syringe is made up of sodium hyaluronate, a phosphate buffer (pH 7.2), and mannitol. Your patients will enjoy the results of this injectable filler for up to 9 months, after which an additional session is recommended to maintain beautiful-looking skin. Carefully store Stylage S in a space where the temperature remains between 2 and 25 degrees Celsius. Unopened, you can store this aesthetic injectable for up to 2 years. Visit RaskelMedical.com to start saving on all of your cosmetic and medical dermal injections with just the click of button. Create your online account and instantly gain access to the best brand name fillers on the market. Plus, when you refer a colleague and they spend $4000 or more, you and your colleague receive a $500 thank-you credit! 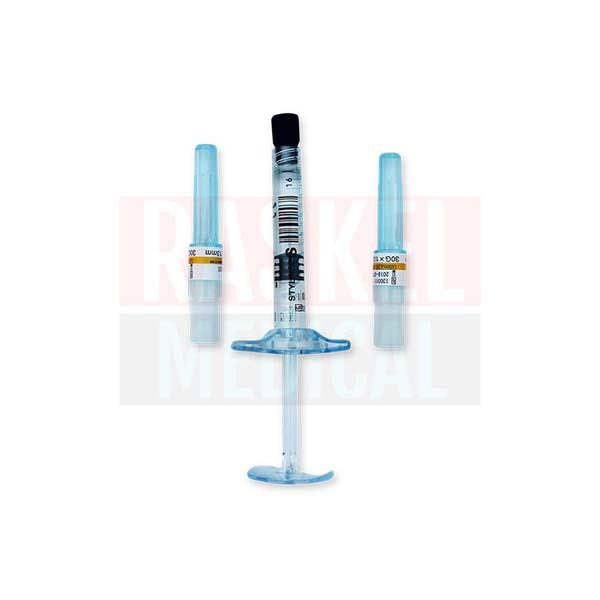 Discover the injectables you need for the prices you love when you visit RaskelMedical.com.